The health benefits and nutrition of the longan fruit and similarities and longan vs lychee differences between longans and lychees including nutritional values are discussed. To know about longan fruit, I bought and tasted it. When I removed the skin of the fruit, I realized that it looked like a lychee from inside, and the taste was also somewhat similar. When we bought a new house two years ago, we did not know that there was a grown up longan tree in our backyard until it produced fruits, over 40 kilos of fruit in late summer and autumn! About 20 years ago I lived in a house in Dehradun, where there were several Lychee trees, besides trees of mango, guava, plum, grapefruit and Jackfruit. So I am very fond of lychees, even we used to make cold drinks of lychees like lychee cordial. The longan fruit (botanical name, Euphoria langana), is also known as the euphoria fruit. It is native to Southern China and similar to lychee and rambutan fruit, all belong to the soapberry family. All the three - longan, lychee and rambutan are closely related but they appear different from outside. By simply looking at them, one cannot say that they belong to the same family and are quite similar from inside. Then what is the difference between lychee and longan and rambutan fruits? Rambutans are red-coloured fruit which are covered with hairs. The rambutan is closely related to the lychee fruit. But the taste of both the fruits are different. While the rambutan fruits have a pink flesh with sweet-sour taste, the lychees have a white flesh with sweet taste. The longan fruit is also known as dragon eye fruit because it resembles to an eyeball when its skin is removed, the black seed shows through the translucent pulp like a pupil. Now as I have eaten both the longans and lychees, I can compare these fruits. Both grow on trees. The lychee trees are denser. Longans are about 3 cm in diameter, the lychees are slightly bigger. Both have more or less similar skin, thin and leathery fragile type. Both are round but they look different. While the logan's colour is light golden brown - very similar to a Kiwi fruit or a Sapota (Chiku), the colour of lychees are redish. Both peels to reveal a translucent pulp enclosing a round, black and shining seed. Both have white pulp. Longan's pulp is slightly crispier and thinner than that of lychees. Both have one dark brown seed in the middle. Both can be eaten straight off a tree branch. They differ in texture. The longan fruits are very smootrh from the outside, whereas lychees have a rough texture. Nutrition wise both the longan and lychee are more or less same. 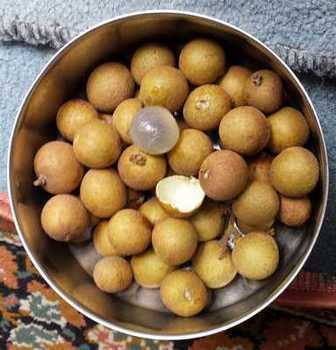 Longan fruit is packed with essential nutrions like potassium, iron, magnesium, phosphorus and vitamins A and C as well as gallic acid, ellagic acid and corilagin as revealed by recent studies, making it a super fruit with several health and medicinal benefits. Longan fruit, dried and fresh has been in use in the traditional Chinese medicine for centuries as a tonic for the heart, eyes, stress reliever, blood enricher, immune booster,and increase vigour. No wonder, it is in super fruit category. Being low in fats and calories, longan is a healthy option for those who want to reduce fats from their body. Anti-depressant: They give a relaxing effect to the nerves and are proven to enhance the nerve function, lower irritability and reduce fatigue. Anti-oxidants helps to combat the free radicals within the body which can help to protect against heart disease, chronic inflammation and the risk of developing certain types of cancer. Reduces stress and fatigue, good for heart reducing the risk of cardiac arrest and strokes. Improves blood circulation and increases the iron absorption in human body preventing anemia. Treat neurasthenic neurosis and insomnia sleeping disorder. High Vitamin C in longans protects the body from cold and flu. The Longan fruit has been used for centuries as a sexual health tonic. Keeps the teeth and gums in a good condition. Skin Tonic: Beneficial for the skin near the eyes, minimizing peeling and cracking of the skin and improves the skin tone. Delays skin ageing adding shine, luster and suppleness to the skin. The seeds of longans contain saponin, which is good for hair including treating premature of gray hair. In Chinese medicine, the longan seeds are applied on the hair and Longan wine blood tonic is advised to drink for premature hair graying. The seeds of longans contain saponin, tannin and fat constricting the tissue and effectively stops blood and other secretion.